Mike Savino of the Tall Tall Trees, the 2018 OzMoMu headliner. OzMoMu is the new favorite music festival in Eureka Springs! 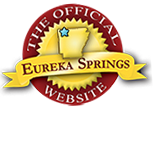 The Ozark Mountain Music Festival returns to Eureka Springs January 18th – 21st. This entry was posted on December 14, 2017 by service424 in Basin Park Hotel, Festivals, Fun Downtown, Musical Adventures, Road trips, Things to Do and tagged Basin Park Hotel, Fayetteville, Friday, Music festival, Ozark Mountain Music Festival, OzMoMu, tickets.